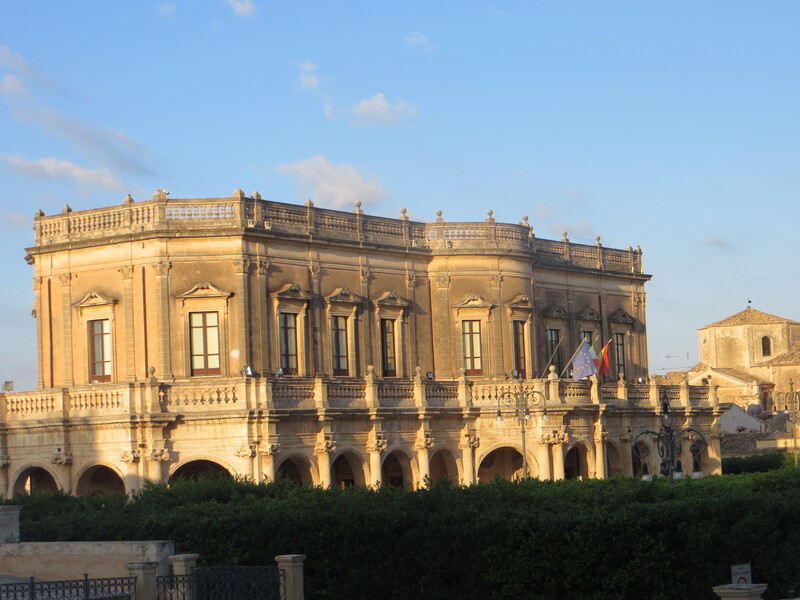 We’ve done the trip from Syracuse to Conversano (a town in the region of Puglia) on the southeastern edge of Italy, where we’re meeting our biking colleagues in a couple of hours. Unfortunately, we’re starting this in kind of a mess – Mark has had a horrible back ache for a couple days and I got a fish bone lodged in my throat last night that decided to stay. I spent a miserable night but fortunately it got dislodged this morning while I was eating a hard boiled egg. Who knew that would work? And it appears that the hard boiled egg trick didn’t do anything for Mark’s back, so we’re going to go searching for a doctor soon. 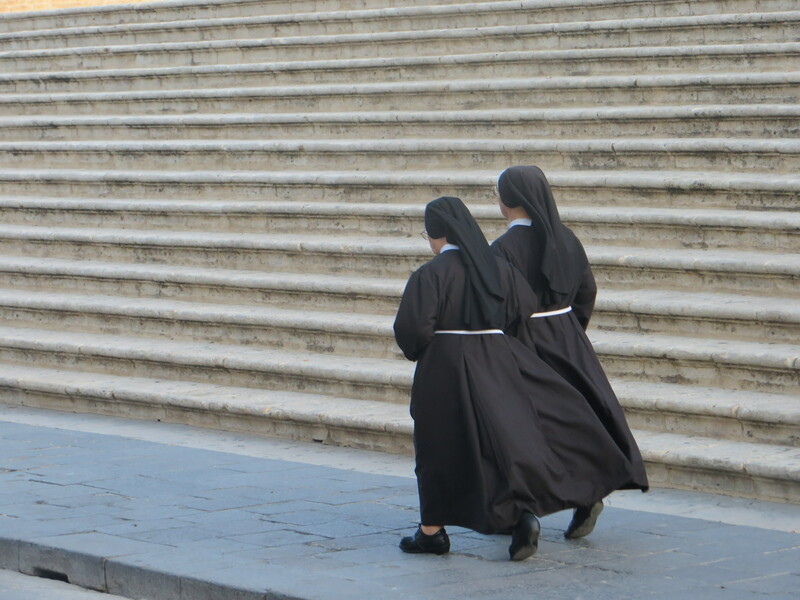 Meanwhile here are some pictures from our drive across Italy. 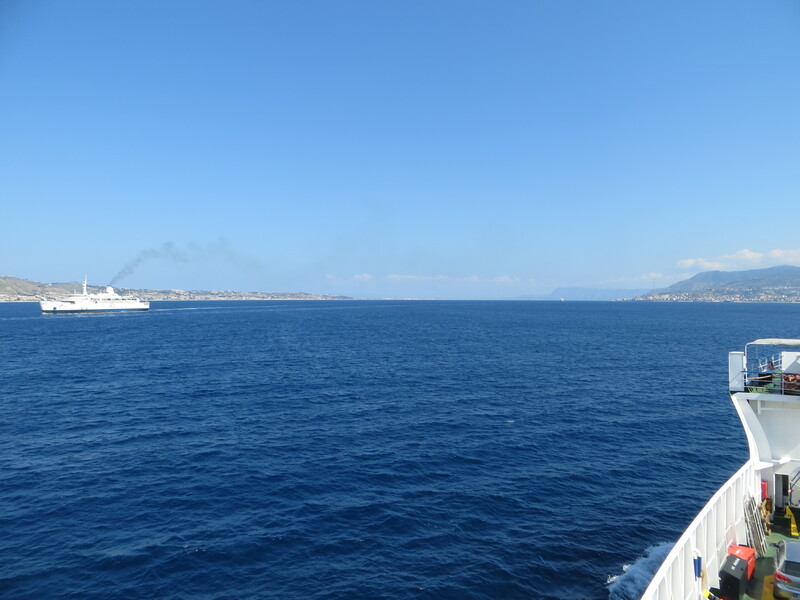 On Saturday we drove from Syracuse to Messina, where we got on a ferry to cross the Strait of Messina onto the mainland. I have to admit, I was surprised by just how close that tip of the island is to the mainland, less than two miles across; there really is no reason not to have a bridge across. 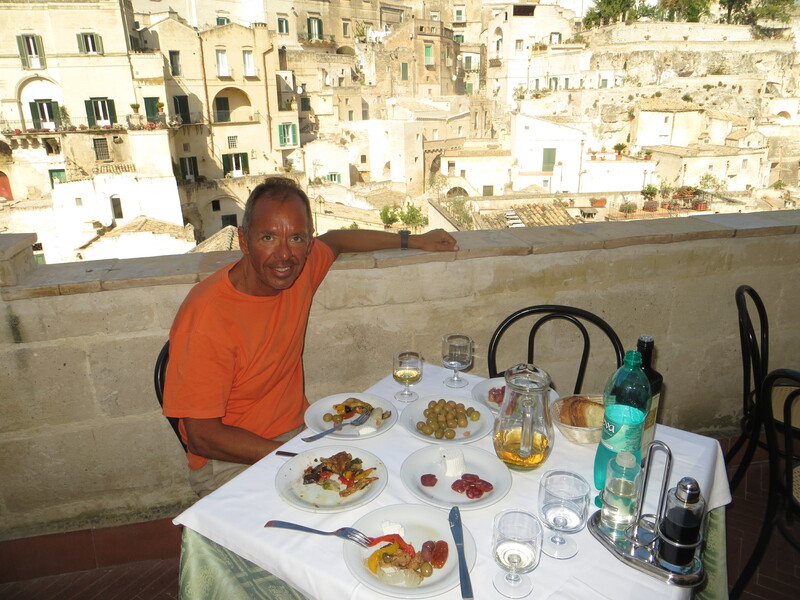 We then continued north to Amantea, a little town on the beach for the night, before driving on the next day to Matera. One of the things we’ve (re)learned in this process is that we really don’t like driving or being in a car. 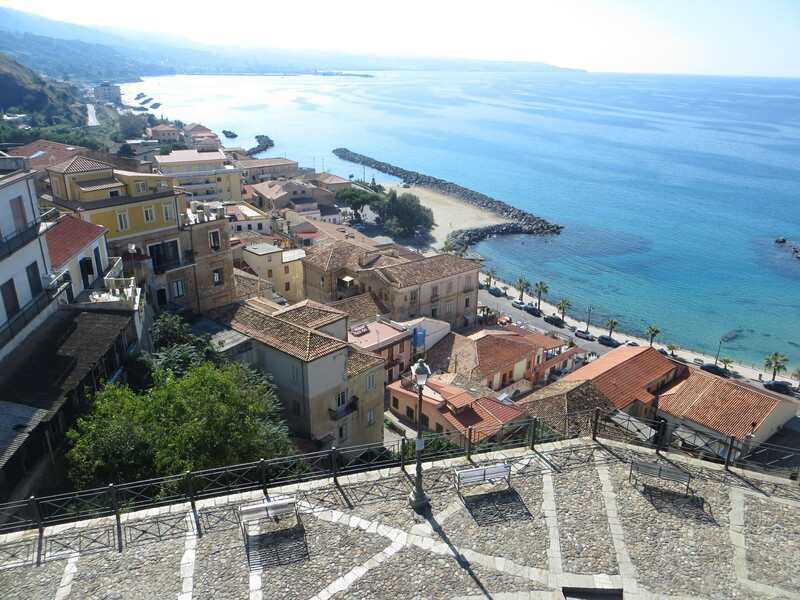 There were small advantages – we wouldn’t have stopped in Pizzo for lunch on a bus or train, we could choose to drive right along the coast in the “instep” of Italy, between the boot and heel – but ultimately mostly just a pain. It’ll probably be a while before we rent a car again. 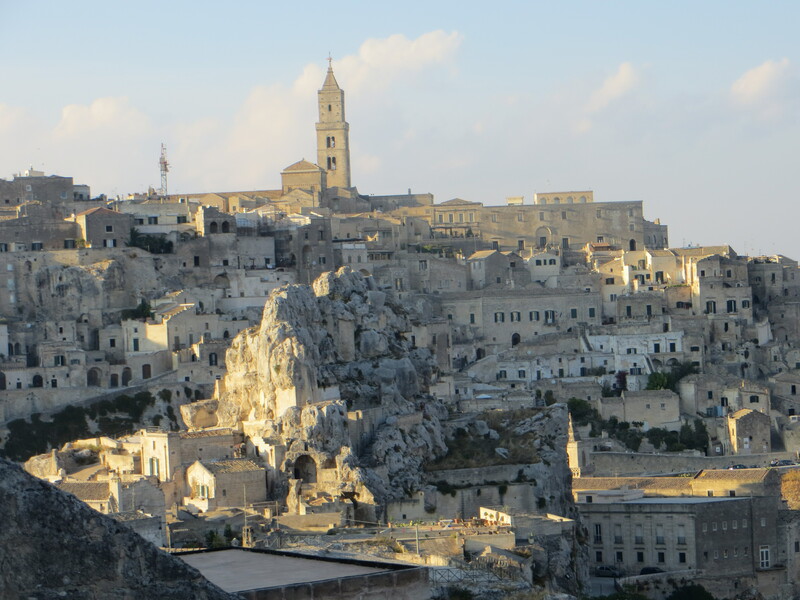 Matera deserves a few words. 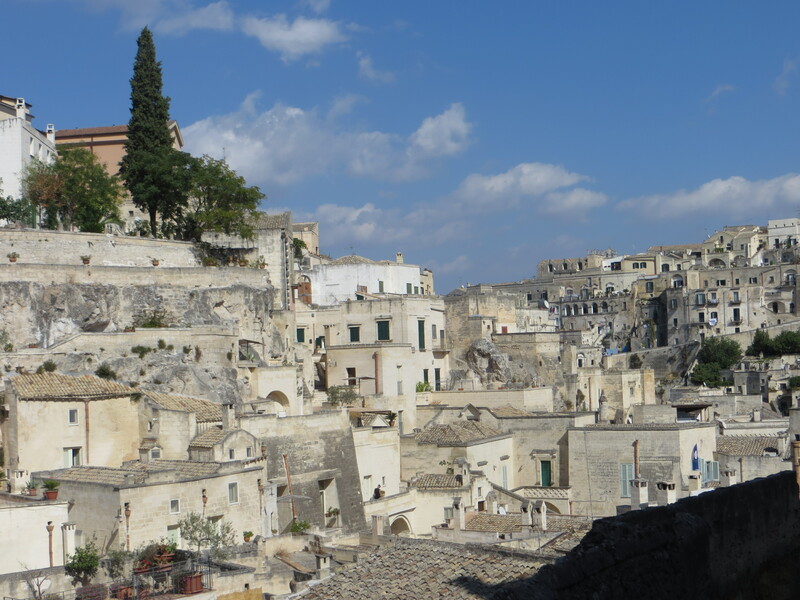 The ancient city, called the Sassi,was founded by the Romans in the 3rd century BC and is unlike anything you’ve ever seen or presumably ever will see. 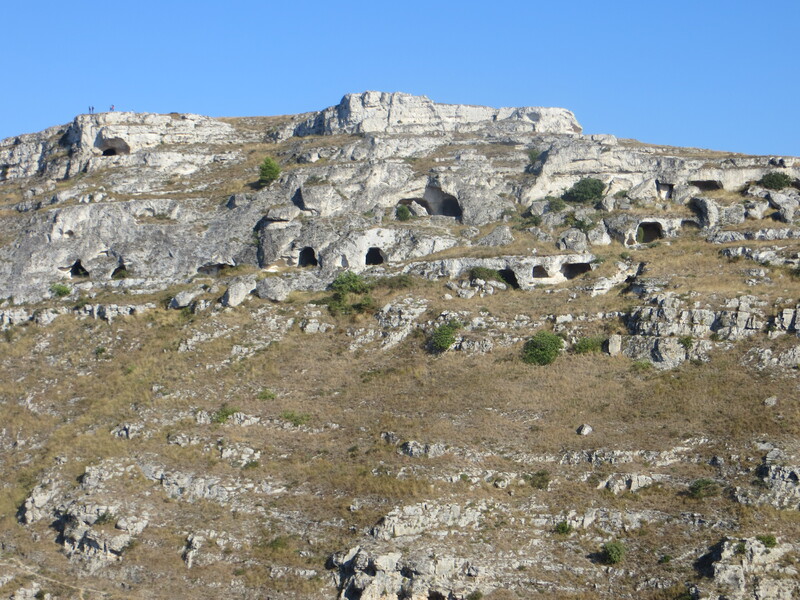 It’s built into the steep side of a valley, with “houses” dug in caves into the rocks. 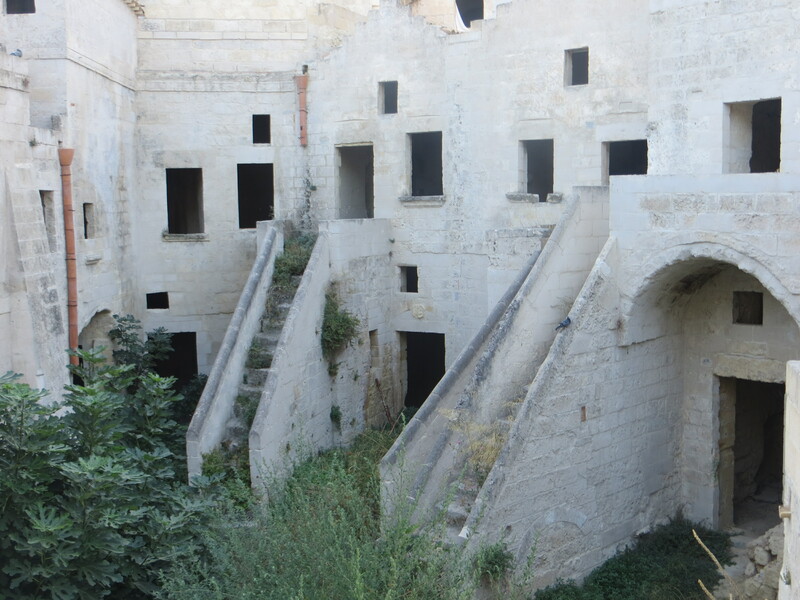 Initially the Sassi looks like sort of normal old construction but on closer inspection you see that most of the construction is just a facade, with the living quarters consisting of caves in the rocks. 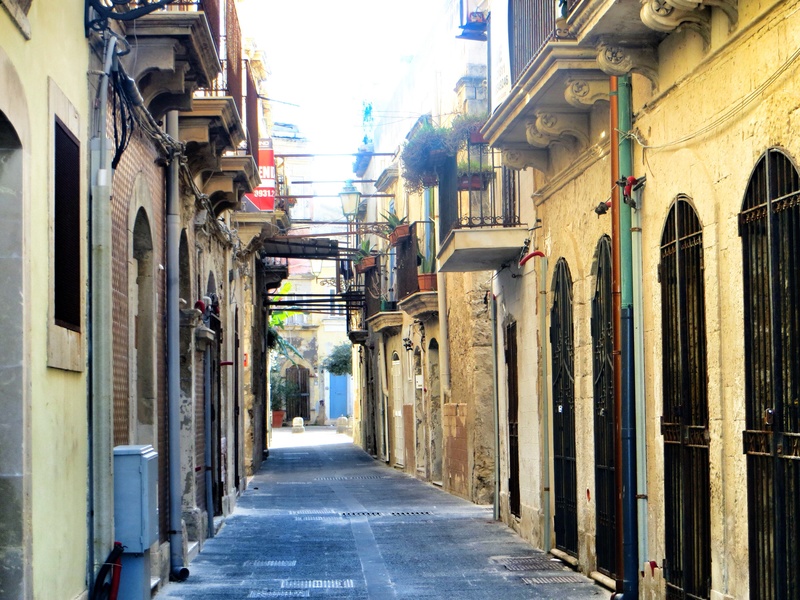 In the 1950s the government forced most people out of the caves into a newer section of the city and until the late 1980s it was one of the poorest areas in Italy. Now, though, it’s a World Heritage site and some of the spaces are being restored into boutique hotels and other tourist sites. All in all a very cool place to stop for a day. 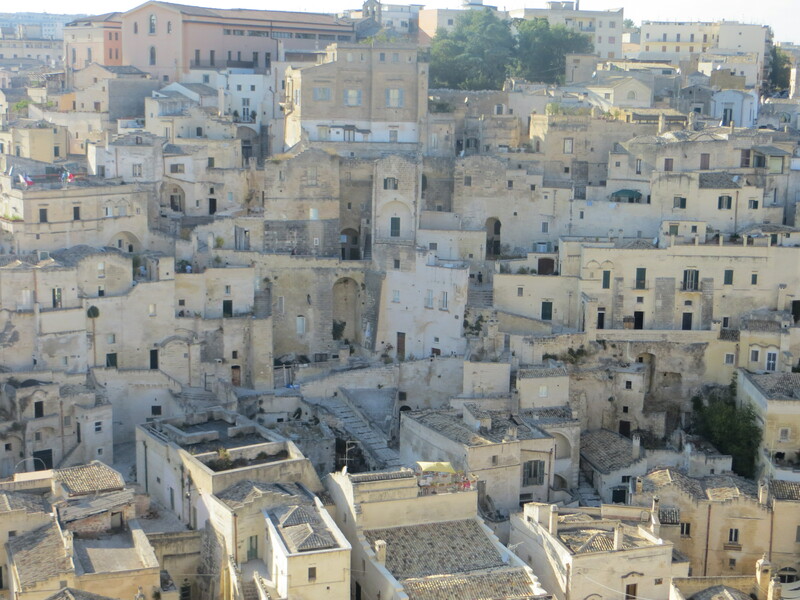 This is the view of the Sassi from the terrace where we ate lunch. Seriously, that was our view. Now it’s off to get ready to bike! I’ve always associated Syracuse with the nice place in upstate New York where my brother-in-law Jamal is from. And I can’t say I’ve ever thought much about where the original Syracuse was located. But now I know. 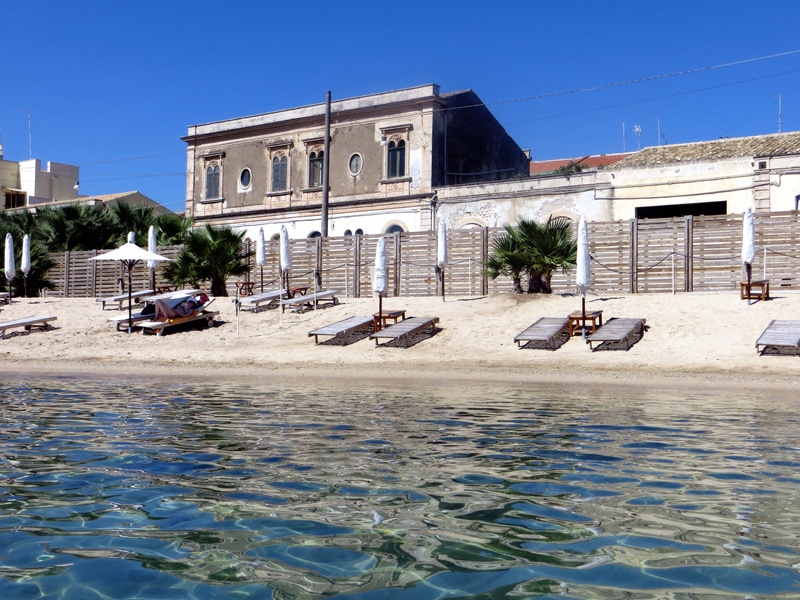 The original is Siricusa, a charming town off the southeast coast of Sicily, where we’ve decided to kick back for three days. 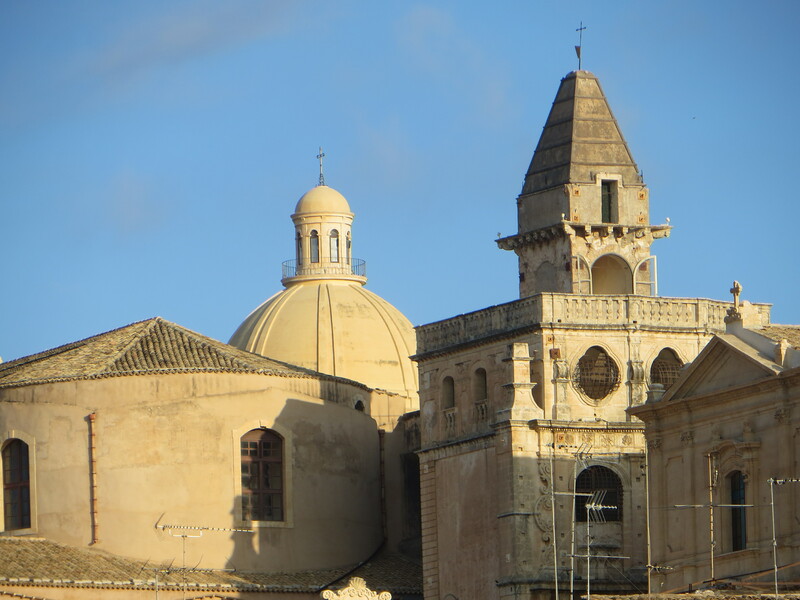 This Syracuse was founded 2,700 years ago by Greek colonists, who were starting new communities in many parts of Southern Italy and eventually Sicily. This location has a lot going for it. It is highly strategic in terms of control of the Central Mediterranean. 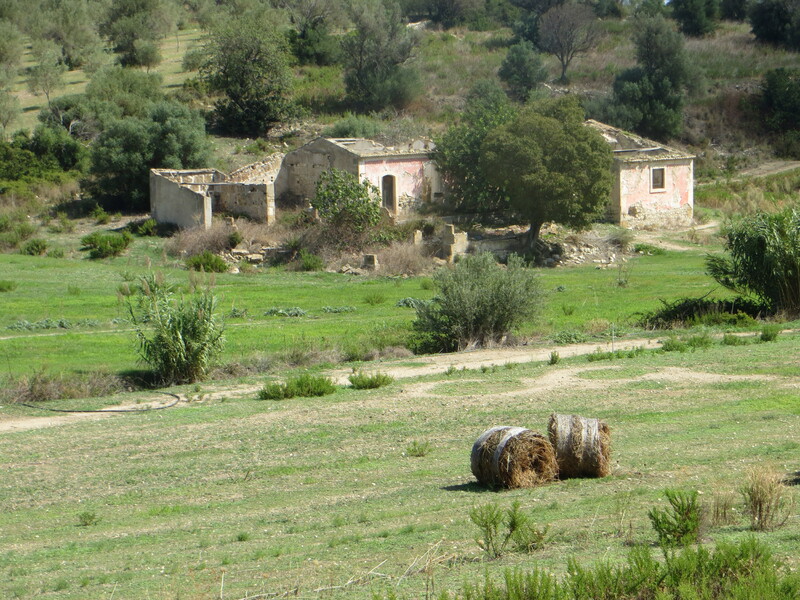 The land here is incredibly fertile, producing not just grain but also great quality olives, almonds, and fruit. 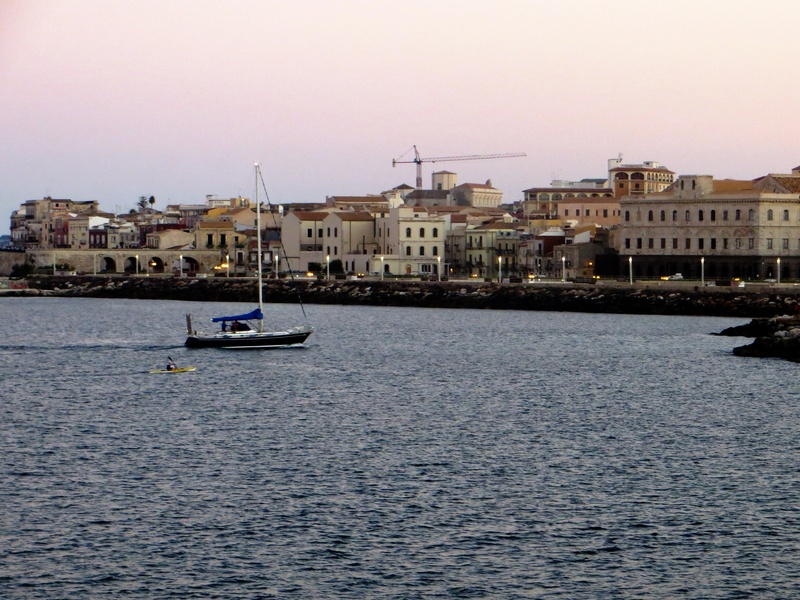 And it’s a beautiful place; Syracuse was settled on the lovely island of Ortygia and the immediate mainland, separated by short bridges. As a result this place took off fast in the early days, quickly rivaling the great Greek cities of Athens and Corinth for influence. By some accounts, Syracuse may have been the largest city in the ancient world in its heyday. But the heyday didn’t last too long. Within just a few hundred years of Syracuse’s founding, Rome was on the rise and Greek satellites were lost. Then Rome fell and all of Sicily was passed from conqueror to conqueror until the Northern Italians took over most recently in the 1860s. That leaves the Syracuse of today: an ancient city, a crumbling shadow of its former self, in a lovely setting, with some wonderful ruins, and a still vibrant and romantic core that is hard not to love. 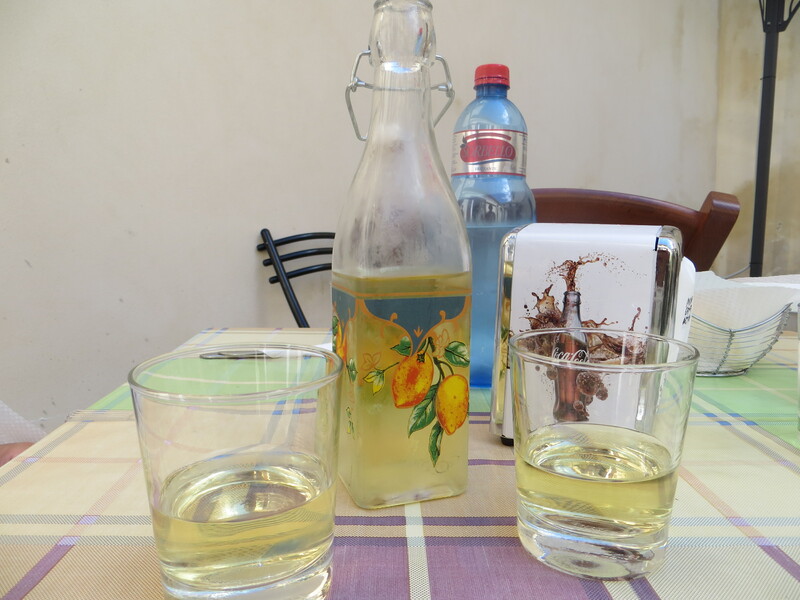 And a surprising number of really appealing restaurants with incredible Sicilian food and cheap delicious wine. On top of that, we found a cozy hotel that sits on a gorgeous little beach just barely off the island, an easy fifteen minute walk from the center. It’s a magical spot, where we get up for a delightful breakfast, spend a long morning on the beach, walk into town for lunch in one of the perfect little restaurants, return to the beach for the afternoon, then go back to town in the evening for another amazing dinner. We could get used to this. 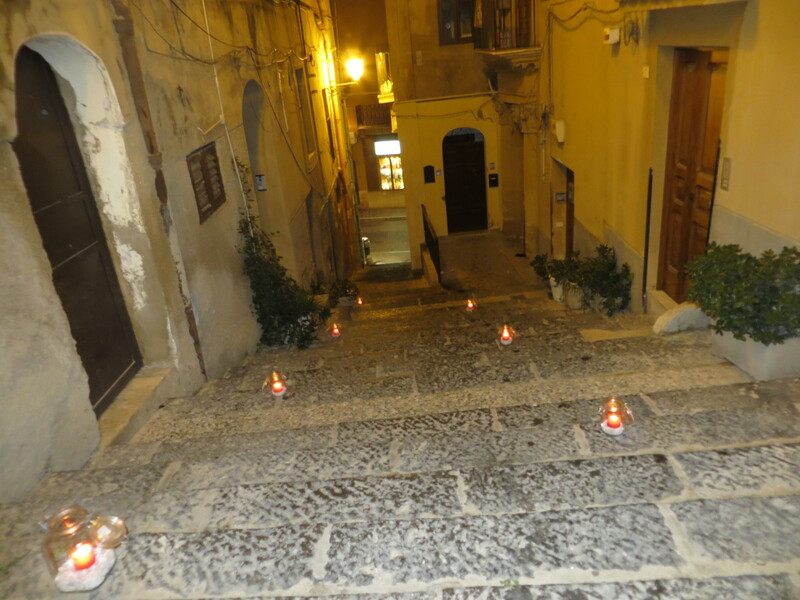 From Agrigento we traveled to Noto, a hill town in the southeast corner of Sicily. 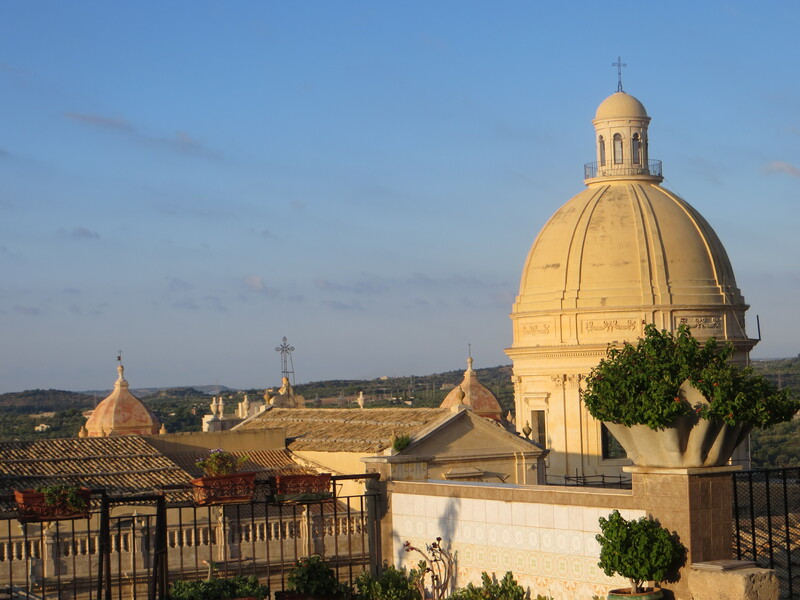 Along with Modica and Ragusa, these towns were all essentially destroyed by a late-17th century earthquake and then rebuilt in the early 18th century giving them a stunning, uniform Baroque beauty. And while officially we oppose natural disasters, this is another example where centuries later the effects can be remarkable. Think Pompeii – a disaster, but pretty cool anyway. 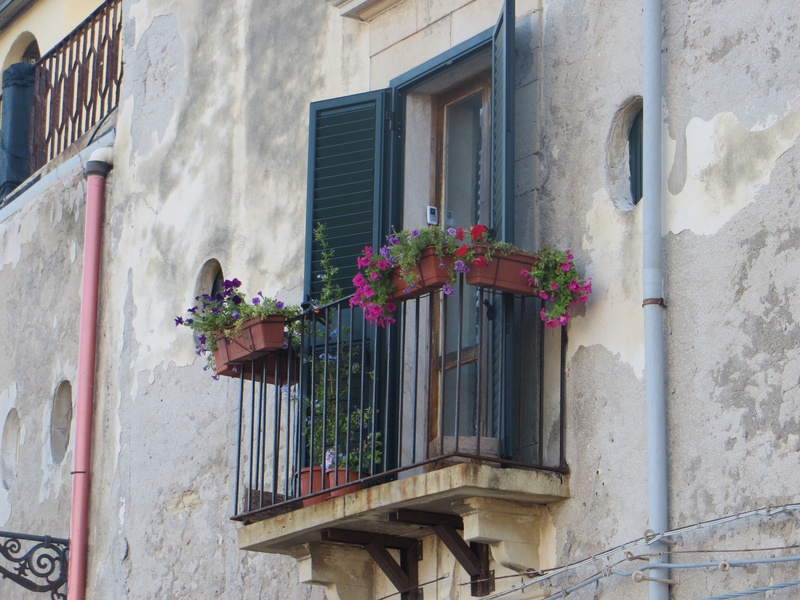 We spent one day hiking five mostly bucolic miles to the neighboring town of Avola. We’re the only people you’ll know who leave a rental car parked so we can walk to the next town and see what’s there. The walk took us through countless lemon groves, lots of late-season blackberries along the road, and probably quite literally millions of olives. 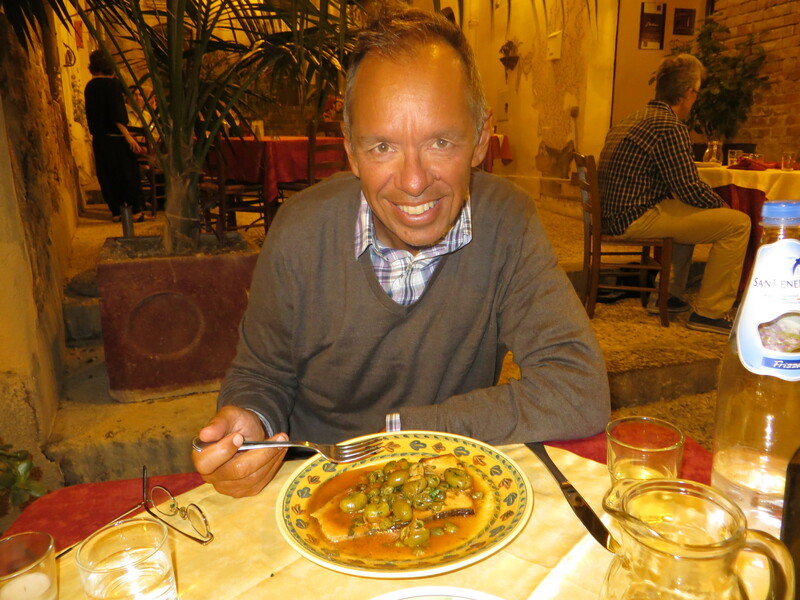 Swordfish Sicilian style – lots of tomatoes, olives, and capers. What’s not to like?